When any couple begins to plan a wedding, one of the key questions they must answer is whether or not to use the services of a wedding planner. Being a self described crafty planner, we opted not to pay extra for a wedding planner because I knew we could do it! Our venue did provide a day of coordinator (who was fabulous and we do highly recommend one of these) but we felt comfortable with unifying our ideas and presenting a cohesive theme. Patrick probably thinks I had a dream wedding planner though because more than once I would wake up in the mornings and tell him about my fabulous new ideas for the wedding that I dreamt in my sleep! I'm having lots of fun putting together these wedding posts in our blog declared February month of love theme! Last week was a post detailing some failed inspiration from Pinterest (non failed Pinterest inspiration coming soon). 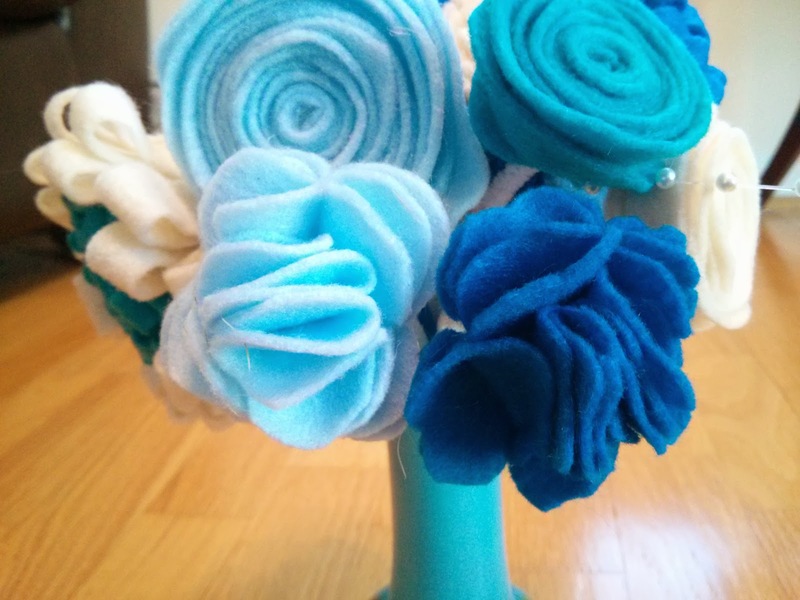 Today's post is about making felt flowers for rehearsal dinner centerpieces. Read on for more details, lots of pictures, and links to various tutorials! I was vaguely interested in doing Do-It-Yourself centerpieces for the rehearsal dinner (didn't want to tackle DIY centerpieces for the wedding; there would be fewer for the rehearsal dinner) and then I saw a really cute felt flower wreath on Pinterest from Etsy. 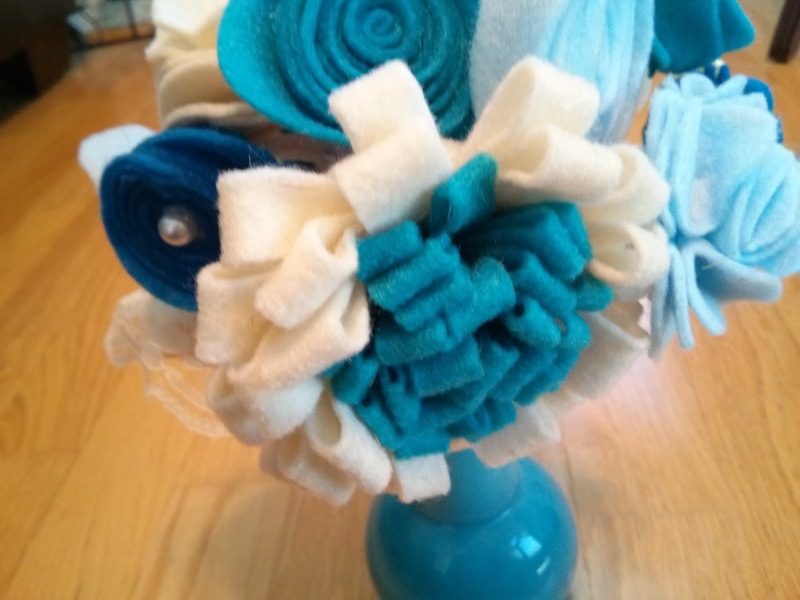 After seeing those felt flowers I decided I could make them for the rehearsal centerpieces... Then off I went to Michael's for some felt (went with blues) and browsed the Internet for some tutorials. I don't like strictly following tutorials because you can merge a few to come up with an even better flower. 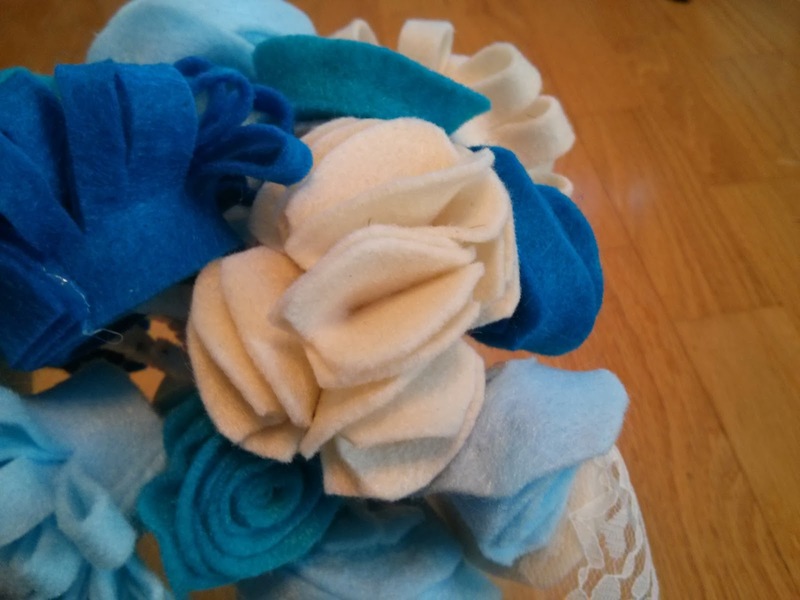 The other thing I really liked about the felt flowers is that they were very forgiving. They were almost impossible to mess up. Even if you cut it in half, you could glue the half back to where you were and keep going! I ended up making three distinct flowers. 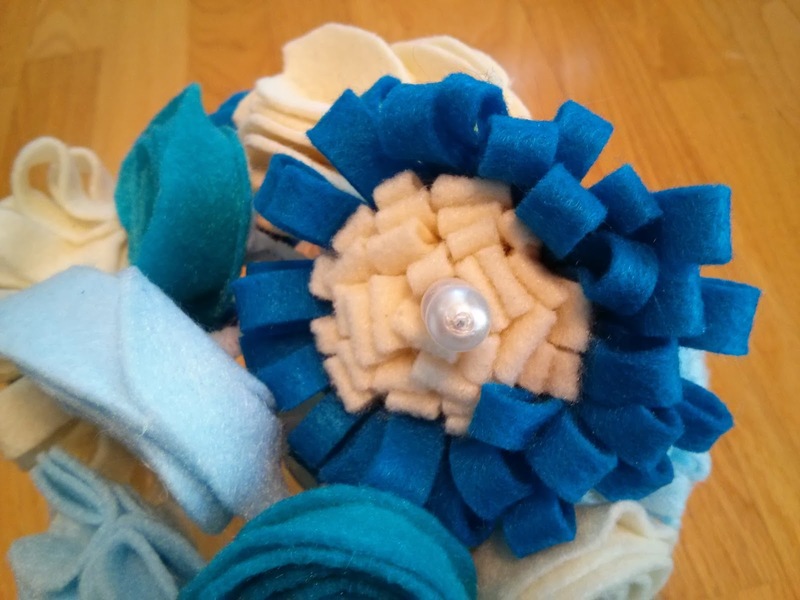 If you are interested in making felt flowers they are a lot of fun! One other note that I did varying from the tutorials (all tutorials below are hyperlinked) is I strictly used my hot glue gun. You will see in some of the tutorials that needle and thread were used but I didn't have time for that! I found that the hot glue held up well. Out of all the flowers we made (and there were a lot) I saw 2-3 of the roses coming a bit undone but nothing major. Whew! 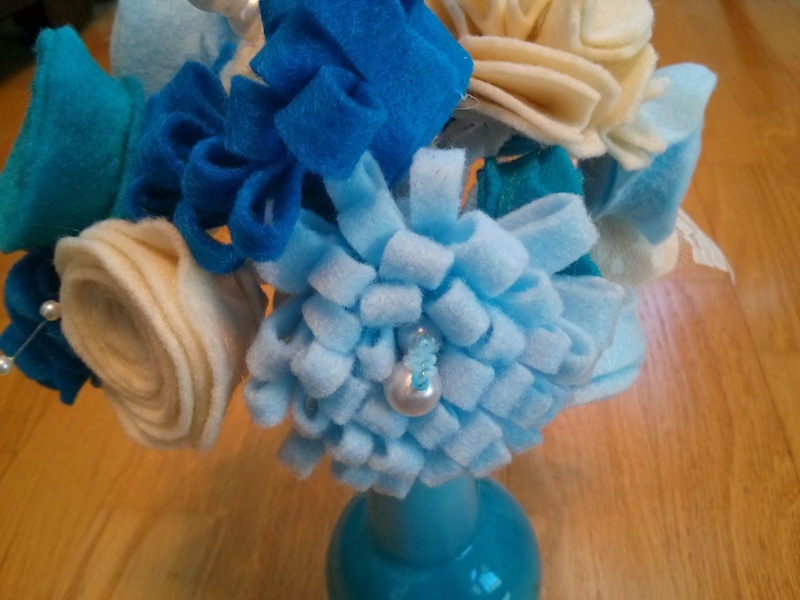 Great success with making felt flowers. 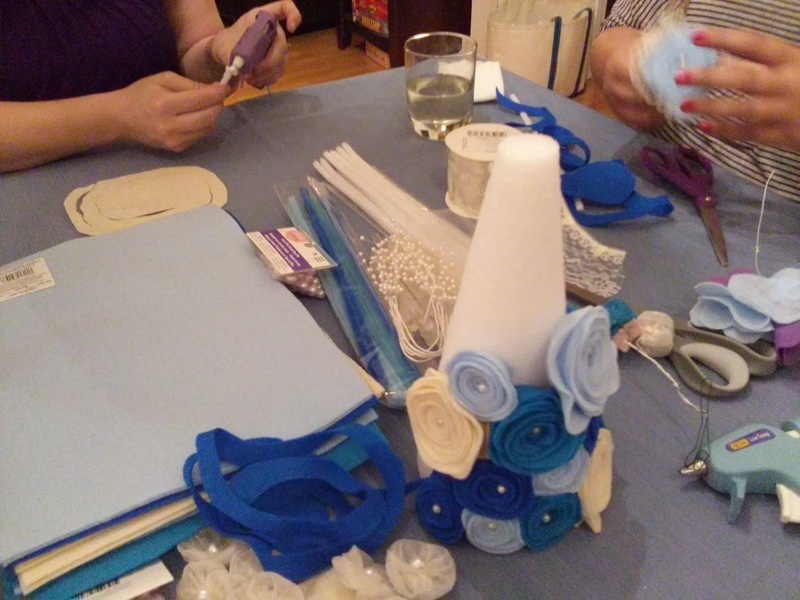 Many thanks to Marianne, Stephanie, Rachel, and my mom for crafting felt flowers with me at some point (there were multiple flower making craft nights, obviously). I decided to make a statement centerpiece for the entrance table in the dining room. I purchased three different sized styrofoam cones and corsage pins to pin the felt flowers with. 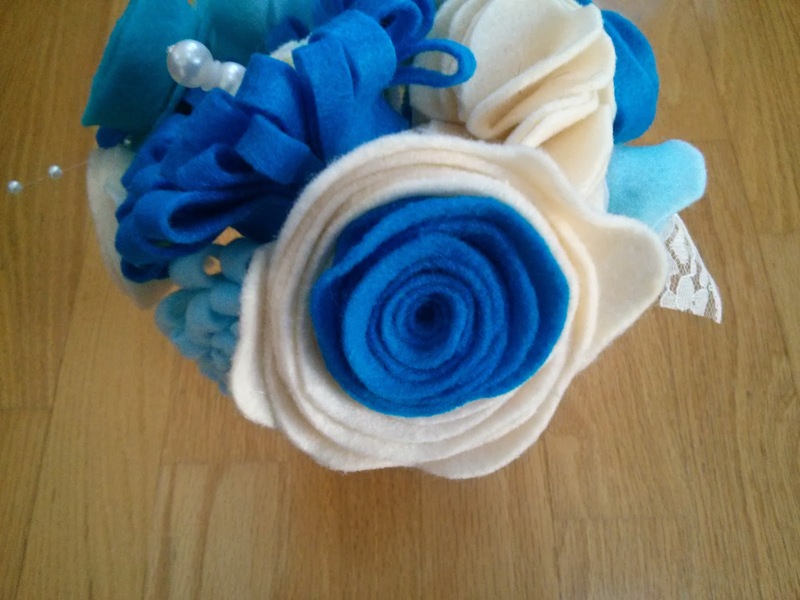 The rose felt flower was the easiest for me to make and I thought looked a bit more uniform so I chose to pin all rose flowers to the cones. Testing out my idea; everyone approved. Almost done with the centerpiece! I purchased a round capiz shell place mat to anchor the rose cones. Now for the dining table centerpieces. The flowers were all attached to pipe cleaners for stems; these aren't very pretty which eliminates glass vases. 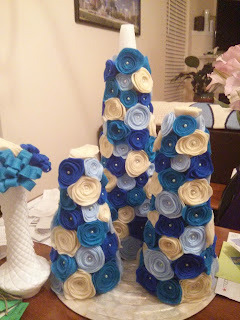 I decided that opaque milk glass vases would be a wonderful vessel for the felt flowers. They would also be nice mementos to share with rehearsal dinner guests. After I decided on milk glass vases, I went to the thrift store to see if it would be possible to find them. On my first trip I found one! Score! So I told my bridesmaids and my family to check around their thrift stores / antique shops to see if they could also find some. The milk glass vases have small openings and wouldn't make a large statement by themselves so I thought each table would need a grouping of at least 3. 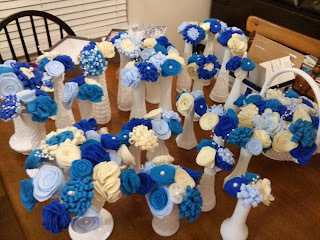 We had 6 tables so that was at least 18 vases. Well what do you know?! The rest of the Triangle area seemed to be out of milk glass vases. Holly found quite a few in DC and my mom and Granny had lots of luck back home. So they saved the day! Patrick and I did find a more unique milk glass vase together. This one was a bit more expensive (around $25) whereas most of the others are under $5 each. We knew we didn't want multiple $25 vases but this would be a nice keepsake for us. Testing out the vases. This picture was taken after my lone thrift store find and the unique one Patrick and I found so folks could see what to look for. 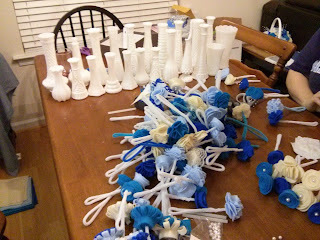 Then it was time to put all the flowers into the milk glass vases. 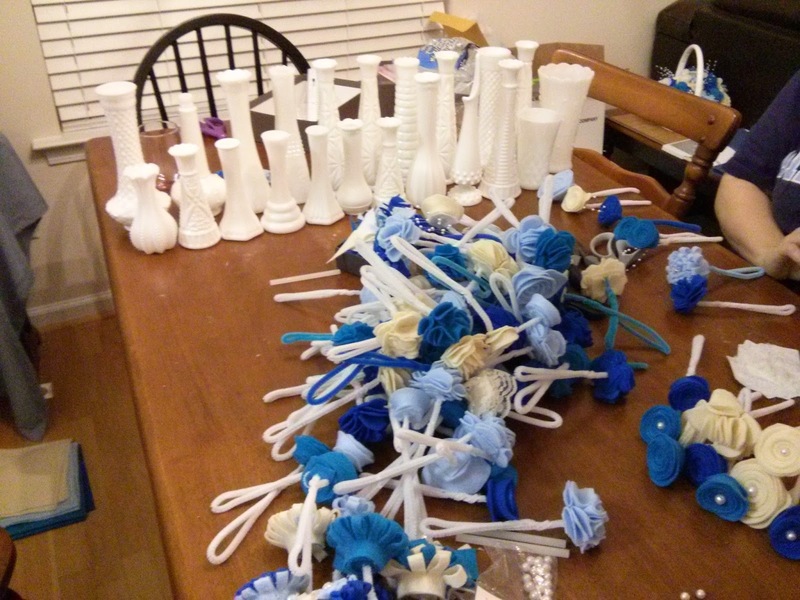 As you can see the milk glass vases varied in shapes and sizes. The smaller ones could fit 4-6 flowers in them while the larger ones could hold more than 10! I know we counted the flowers but I can't remember how many there were! 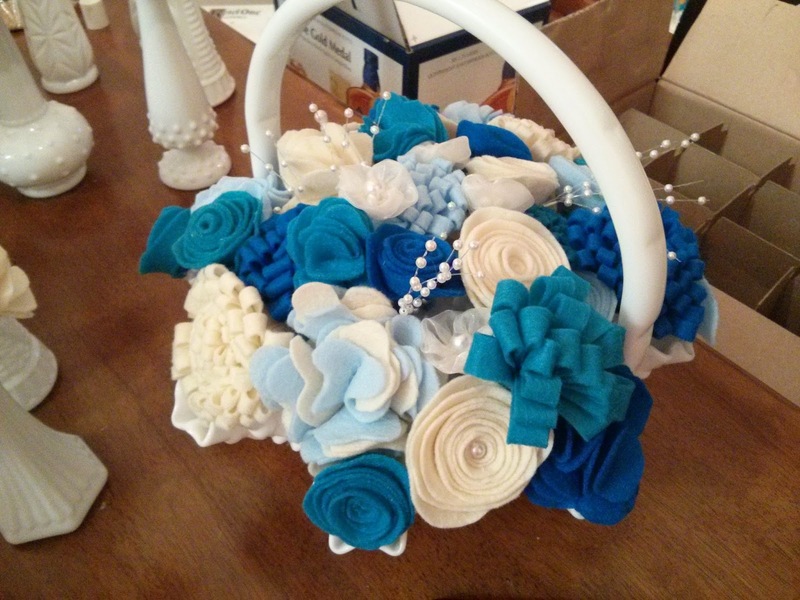 Granny had a milk glass vase basket (you can't really tell this is a basket from this angle) that was fun to fill with the flowers. Enjoy these snapshots from the rehearsal dinner! As I mentioned earlier the milk glass vases were placed in small groupings. On this particular table there were two sets of three at each end for the centerpiece. This was the table at the entrance of the dining room. We had the statement rose cone centerpiece here along with the guestbook. We let rehearsal dinner folks get a head start on signing it. After the rehearsal dinner the group moved to the parlor for some cheers and toasts. Whoever wanted to share some sentiments about marriage or their support did so at this time! This is definitely a highlight of the wedding weekend! I know Patrick was glad to see this project concluded! 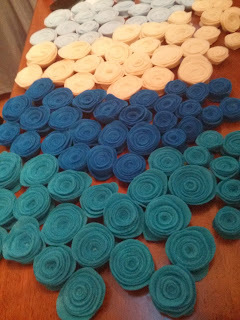 The felt flowers kind of took over everything but they were worth it. As wordy as this post was I did leave out some details for the flowers; if you'd like to make them I'd be happy to give you more details! I could not help much with the flowers because my hands were bothering me with carpel tunnel syndrome but I had so much fun there talking with Marianne and Rachel and Whitney. Granny and I had fun going to her favorite antique store in Powellsville. 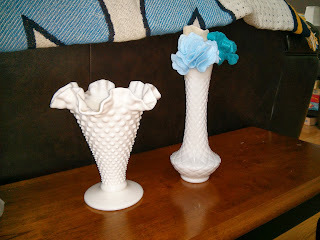 I also got some vases at the blue front shop - one of Whitney's favorite shops.